Visit 'Seizure Tracker® Optimized' from your web enabled mobile device. 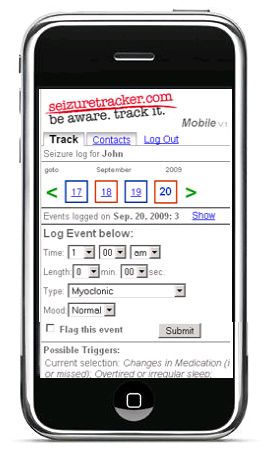 Easily log/edit seizure activity, rescue medications and get access your contact information entered on the main site all from your web enabled cell phone through Seizure Tracker® Optimized. SeizureTracker.com will detect most mobile browsers and automatically redirect you to the mobile optimized site. If for some reason this is not done automatically you can access it by visiting the 'Go Mobile' page from the Seizure Tracker home page. • The calendar navigation interface include four days instead of a full calendar month. When the user first logs on it will start at the current day. 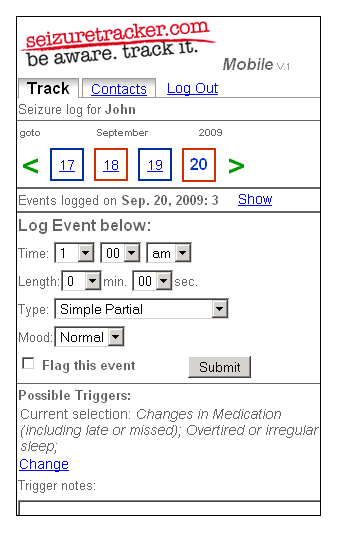 • Daily notes can be recorded and view/edited through the Mobile seizure logging interface. If there are no notes entered for the day being viewed the notes section will indicate being "Empty". • The daily event list is hidden and can be viewed by clicking the 'Show' link next to the daily count number. If there are no seizure logged on that day the 'Show' link will not appear. • As with the normal site the setting are remembered from the last seizure logged. Those settings are listed in each of the three logging sections. They can be changed by clinking the 'Change' link under each of the section description values. • Mobile users can also add rescue medication dosages and access a limited contact interface.